Simon & Schuster Books for Young Readers, 9781416909620, 176pp. When Daniel figures out how to control his shrinking, Pablo is ecstatic. Together, they come up with a whole list of fun things to do when you’re tiny—and at the top of the list is to take a teeny tiny rocket ride. So when Daniel joins a Model Rocket Building workshop, it’s the perfect chance. Daniel can build the rockets, launch Pablo, and then shrink down and get into his own rocket. But when Pablo and Daniel are separated in midair, things get sticky. Daniel lands safely next to a terrifying sabertooth tiger fossil, but Pablo lands somewhere in the La Brea Tar Pits. 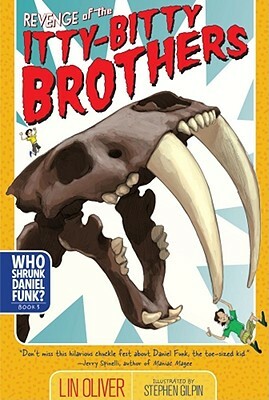 How do you find a mini-brother in a land of concrete sabertooth tigers? Lin Oliver is the author of the Who Shrunk Daniel Funk series, and the co-author, with Henry Winkler, of the bestselling Hank Zipzer series. She is a writer and producer of movies, books, and television series for children and families. The co-founder and executive director of the Society of Children's Book Writers and Illustrators, she lives in Los Angeles with her husband and sons. Visit her at linoliver.com.